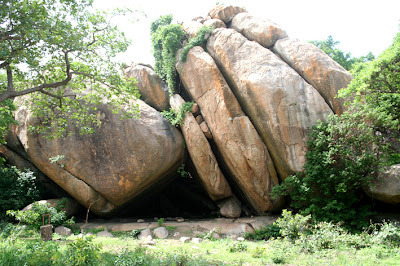 Deep within the forest of the Old Oyo National Park (3 hours drive from Ilorin) lies the ruins of the Oyo empire. It is a serenely tranquil, sacred place. Here is the cave where the original settlers stayed before the town was built. Bats fluttered wildly inside as we entered. They are seldom disturbed by visitors. Ha, reminds of my home! My grandfather's house is surrounded by rocks like these. Such beauty. We left the rocks there and didn't break them down to construct a road, so we park the car far from the house. The view when you wake up in the morning makes up for the walk from the car. Here's to all the children of Oyo, Oke-Ogun, Osogbo, Ogbomosho, Abeokuta... I wish we could just appreciate the Yoruba culture more!